I’m sure you remember what happened to our 15-year-old mango tree. Last month, hubby and I made a difficult decision to cut down the tree. We let the men from the Department of Environment and Natural Resources (DENR) to cut down the mango tree which is beginning to cause headache to us. They happened to be in the neighborhood during the time to cut down a Kaimito (Star Apple) tree in the middle of the narrow street adjacent to our place. I told my husband to bid goodbye to the tree that gave us juicy Indian mangoes and cool shade at noon. We need to cut down the tree because some insensitive neighbors are looting the fruits without our permission. They stepped on the galvanized roof to get the mangoes as if they are walking on the ground. The rusty roof is just supported by a temporary post placed by hubby to prevent it from caving in. You can only guess what will happen to someone if he steps on the roof, all that for the value of a few pieces of mango. Another reason why we have to let go of the tree is rain pummeled the accumulated dried leaves and other debris into the gutter. The men were using some kind of special saw blades to cut the tree into pieces. I really feel bad during the time, but we have to do something to avoid future confrontation with insensitive neighbors. 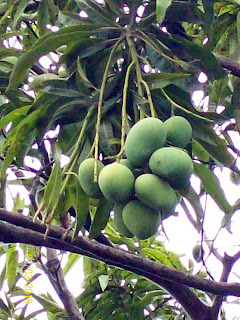 We still have two growing mango trees which my brother-in-law planted in front of our house. This entry was posted in Uncategorized and tagged cut down tree, DENR, Indian Mango tree on April 4, 2010 by Yami.